A business park along Narellan Road combined with existing medical facilities could prove a tasty carrot for health-related industries, Campbelltown mayor Paul Lake said. The Advertiser last week revealed the proposal for the first stage of a business park had been supported by Campbelltown Council. The 60-hectare precinct — which will go on public exhibition — would be located on the Maryfields site, to the south surrounding the current University of Western Sydney and TAFE campuses and also include land near Farrow Road. Stage one — the Nexus Business Park — only includes land on the Maryfields site, although council was hopeful the entire precinct would come to fruition. “One of the hopes is to attract educational, medical and health [industries] and any businesses that relate to those industries,” Cr Lake said. Cr Lake said Macarthur could be the major medical precinct between Sydney and Canberra. “We could have a new children’s hospital that services the south-west region down to Canberra,” he said. THE Franciscan Friars and Poor Clare Nuns will retain 6ha of land off Narellan Rd, near Campbelltown – earmarked for a business park – and plan to develop an environmental discovery centre. The historic Stations of the Cross will remain the focal point, but will be complemented by the environmental heritage of the site. Development planning director Wayne Camenzuli, on behalf of the religious orders, said the proposal, subject to Campbelltown Cou­ncil approval, was a long-time intent by the friars and nuns to re-establish their identity with an enhanced environmental centre. 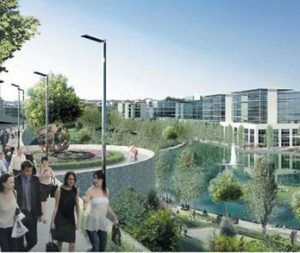 The development would incorporate a centre, walkways over the Bow Bowing tributary and the possibility of opening up the “signature” dam to recreational use. “What the friars and nuns would like to do is integrate the religious history with the environmental heritage,” Mr Camenzuli said. The two religious orders signalled their intention earlier this year to sell off excess land – about 12.7ha on Narellan Rd. Subject to more environmental investigation and reports, the plan is to develop a business park as well as residential and seniors housing on the site. EMPLOYMENT opportunities will be one of the upshots with the development of the Maryfields site. Planning director Wayne Camenzuli said that had been one of the main intentions of the Franciscan Friars when they decided to go ahead with plans to develop the property. “They realised Campbelltown didn’t have a business park, and with the population growing and needing more employment this would be a good fit,” Mr Camenzuli said. He added the Franciscan Friars and Poor Clare nuns would “absolutely remain” on the site. Mr Camenzuli said any development was at least two years away. He anticipated artists’ impressions of the park would be available in a couple of months.